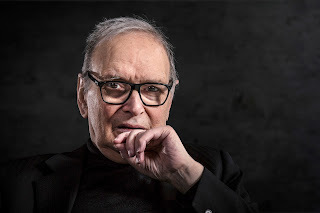 In a world that sees the phrase "legend" used far too freely, Ennio Morricone defines the word. The maestro has been composing film scores since the 1960s and whilst his name may possibly be unfamiliar to an ignorant few, his haunting theme from Sergio Leone's spaghetti western The Good, The Bad and The Ugly is up there as one of the most famous tunes. Ever. Having given the movie industry so much of his talent for so long, recent years have seen Morricone, who at 87 still composes, undertake frequent tours performing a selection of his work live. The evening's programme has to be kept to only a selection, for records suggest that he has scored close to 500 films. At this concert the elitist snobbery so often associated with orchestras and arias is deliciously turned on its head. In an era where the world's popular music is so often derived from a 12 bar blues structure, it has been left to cinema to provide much of the fertile ground in which composers can bring lavish symphonies to commercial success. The great film composers (of whom Morricone is one of the greatest) bring a classical structure to a mass and popular market and all too often it can be a movie's fabulous score (think here of John William's Star Wars theme or Bernard Herrmann's Psycho-tic strings) that lives in our memories, serving as a movie's truly lasting hallmark. Sat in London's cavernous yet packed O2, there was a rock concert feel to the evening. Merchandise was on sale (and yes, hell yes, I bought the t-shirt) as banks of speakers and jumbo screens brought the music to those on the arena's perimeter. And so what if the music was pumped up through (for the most part) a perfectly balanced sound system? Morricone had always intended it to be played via Dolby's finest technology from the outset. 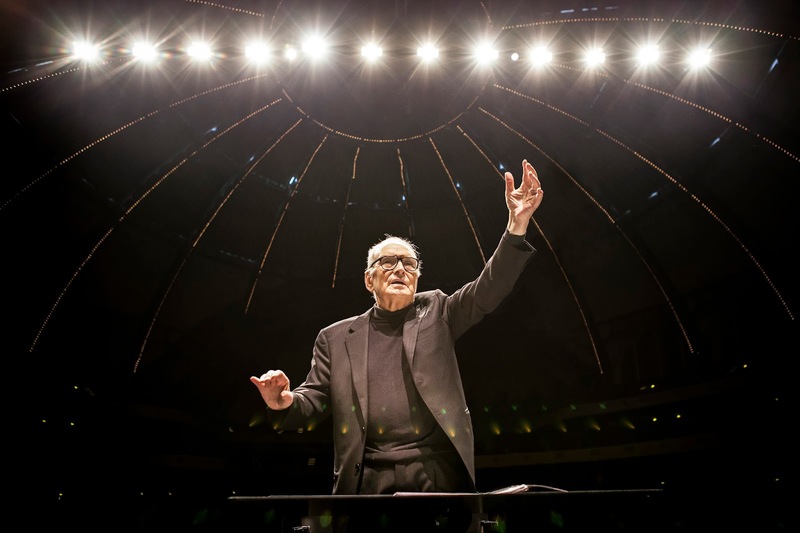 Where most touring concerts typically number less than two dozen artists and a swarm of roadies, Morricone travels with The Czech National Symphony Orchestra along with both the Hungarian Kodaly and Csokonai National Theatre Choirs. That’s a total of 200 performers plus crew. Floodlights illuminate the stage in a simple white wash and that’s it. There is no need for spotlight-stabbed smoke or a dazzling laser display. The charm of this gig lies solely in Morricone's magical melodies. The Italian was one of the first to fuse the majesty of a classical orchestra with the emergent post-war electric instruments such as guitar, bass and keyboard and the video screens helped pick out the artists such as Rocco Zifarelli on electric guitar and Nanni Civitenga, on bass whose contributions so subliminally enhanced (by way of example) The Good, The Bad and The Ugly and Chi Mai respectively. Older readers will of course recall Chi Mai as the theme to the BBC's The Life And Times Of David Lloyd George. Not all of the evening’s programme was Morricone's most famous works. Kicking off with a homage to Giuseppe Tornatore (and quite why Cinema Paradiso was omitted from the night remains a mystery) The Legend of 1900, from the film of the same name, offered an enchanting harp section that melded into a mournful violin solo with a hint of blues, evolving into the most gorgeous example of the Italianità - that espresso-infused essence of style that so defines the beauty of modern Italian culture. The first unrestrained whoop of audience pre-recognition came as (a shamefully unnamed) wind-player put a Hohner to his lips for the opening bars of The Man with the Harmonica from Leone's epic western, Once Upon A Time In The West - a score that was in fact completed some six years before photography began on the movie - Hearing the haunting riff was spine tingling - but when soprano Susanna Rigacci stepped up to sing the aria to Jill’s Theme from the same movie, tears flowed and here was the very essence of Morricone's craft. There was no clever, witty libretto for the diva to sing. Just her ethereal voice in perfect harmony with the orchestra. And remember that in cinema, often, no narrative is asked for from the composer - the director, screenwriter and actors do that bit. Most times the composer is there to simply enhance the visuals and dialogue. So when a wordless melody, taken on its own and away from the distraction of the silver screen can prove so exquisite - there can be no better definition of Morricone's genius. Rigacci only fuelled my love for the soprano voice, remaining on stage to sing The Ecstasy of Gold. Don’t recognize the title? Search it out on You Tube and you'll certainly know its melody. As she closed the first half, the audience rose in thunderous appreciation. Further treats included Deborah’s Theme from Once Upon A Time In America and a closing trio from The Mission that ended the programme with On Earth as it is in Heaven. The music had been magnificent in the movie, however live and under Morricone’s baton, it wasn’t so much a waterfall as a tsunami that engulfed the O2. The purest, most modern yet majestic beauty of man, woman and instrument in perfect harmony. It is perhaps Morricone’s fellow artists who can best pay him tribute. 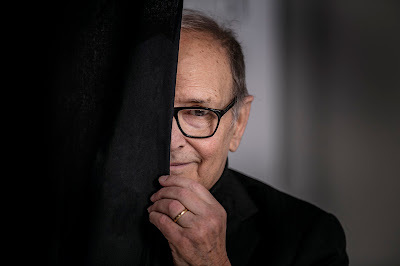 Composer Hans Zimmer, 30 years Morricone’s junior, has said of the Italian that “there are a handful of great composers, but Ennio is so above everybody”. Whilst Tornatore himself commented “he is not just a great film composer, he is a great composer”. Three thunderous ovation-fuelled encores were to see Rigaccci return to finally end proceedings, reprising The Ecstasy of Gold. The emotions and the talent of the night were unforgettable. 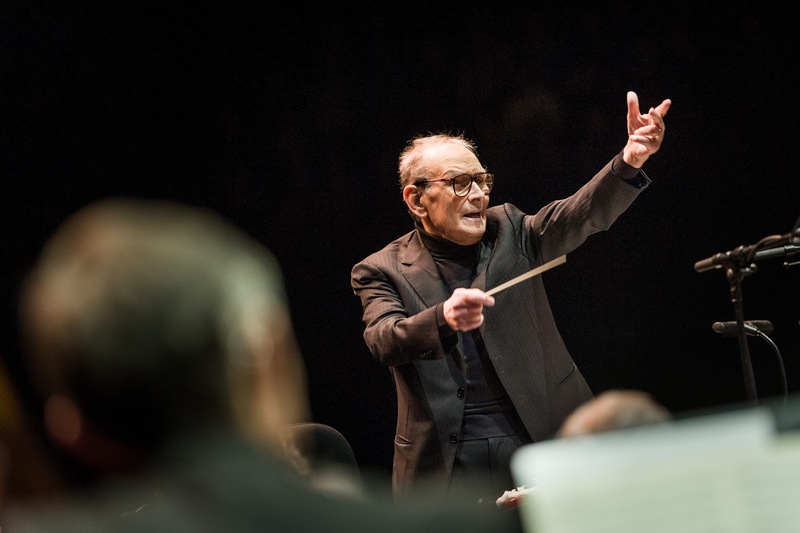 Ennio Morricone is 87 years old and has already created the legacy of a legend. Thanks Nanni - Happy to have corrected, Sir.